Cook this weeknight entrée of Poached Eggs in Ancho-Tomato Sauce. This poached eggs dish is made with on-hand ingredients, so it couldn't be easier! Blend tomatoes, garlic and ancho pepper in blender until smooth. Cook bacon in large skillet until crisp; drain on paper towels. Discard drippings. Add onions to skillet; cook and stir 2 min. Stir in tomato mixture; bring to boil. Add mixed vegetables; cook 3 min., stirring occasionally. Break eggs, 1 at a time, into small bowl; slip over vegetable mixture in skillet, leaving space between eggs. Cover; cook on medium-low heat 8 min. or until whites are completely set and yolks begin to thicken but do not become firm. 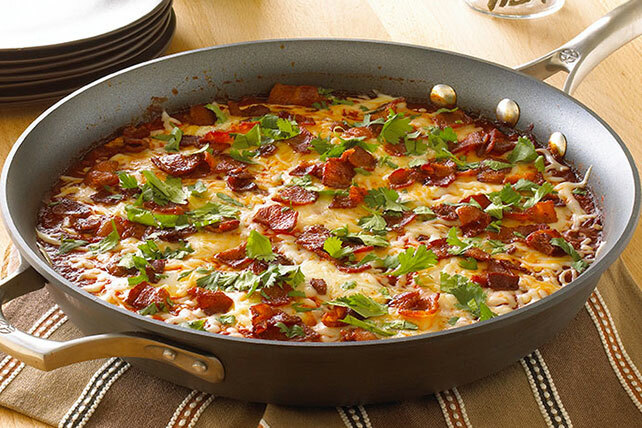 Top with cheese, bacon and cilantro. Serve over hot cooked spinach, rice or spaghetti. Substitute ground chipotle pepper for the ancho pepper. Substitute 1 stemmed fresh jalapeño pepper for the ground ancho pepper.